For businesses in search of cost effective customer service solutions, outsourcing your incoming inquiries to a call center based in the Philippines can be an outstanding option. Executive Boutique specializes in providing organizations of all sizes with the tools they need to stay in constant contact with their clientele at a much lower cost, allowing you to get the absolute most from your investment in scaling your operations to meet consumer demands. Many of our clients are surprised to discover just how economical our services can be. Our rates are linked directly to the level of specialization your incoming calls require, and so you only pay for the solutions your specific business needs. Factors that determine the overall cost of our call center outsourcing include the number of agents you need, the technical knowledge required of each agent on our team, and the nature of the services we will provide. Executive Boutique focuses on delivering an upfront rate schedule that covers all related labor costs, equipment usage, and other expenses. Unlike with many other companies in our space, our business structure allows us to eliminate any startup fees and other hidden costs. Interested executives should contact our customer support team for a no-obligation quote that addresses your exact needs. Will My Customers Be Able to Tell the Difference? Executive Boutique does everything possible to ensure your clientele experiences a comparable quality of service as with a domestic call center. We have selected the Philippines as a base of operations because schools and universities are taught in English with American pronunciation and word usage. Every customer service agent under our employ has been extensively screened for the best available verbal and written communication skills, as well as minimal spoken accent. In addition to having the best possible talent pool to select from within the third-largest English speaking nation in the world, we also take great care to bring you the most suitable workforce for your needs. Not only do we have sample voices that our clients can listen to on our website prior to committing to our services, we can also schedule a time for you to speak directly to some of our agents as well as individually interviewing them to determine their suitability. Executive Boutique uses a state of the art VoIP telephone system specifically designed to provide excellent call quality as well as high transmission rates (less than 200ms) so there is no discernible delay with the typical phone call, and our lines are open 24/7. The experience is almost indistinguishable from conventional telephone lines, and you can always arrange for a live demonstration before you commit to a contract with us. As part of our focus on providing a seamless service that is virtually equivalent to a domestic call center, your agents can be assigned area codes and telephone caller ID from any location you choose. This means your customers, clients, and prospects should not find any difference between our international call center and domestic customer service solutions, giving them a reliable option at a much lower cost to your business. Executive Boutique’s meticulous approach to call center outsourcing is designed as more than an economical alternative, but a fully integrated extension of your staff. Talk to us today about what our services can offer your organization. Using the right set of tools and programs play a crucial role to the success of contact centers. Not only do the right tools enable BPOs to scale their operations while keeping their process seamless, but it also impacts how they service their clients’ customers. With the contact center industry’s steady growth, various software solutions have been created and developed to aid its operations. This is often the main component and the heartbeat of operations of contact centers. It is the telecommunications technology that enables two or more people to get connected. If the telephony is the heart, then the ACD is the backbone of operations. This software allows incoming calls to be routed to the agent who is best able to assist with the caller’s concern. ACD also keeps track of data such as call volume, calls received, call wait time and duration. It also enables call monitoring, call conferencing, and call barging. Also known as the voice response unit, the IVR, which is an automated system, allows interaction with a caller, gets information and then filters the call and routes the caller to the appropriate agent or department. It accepts both voice telephone input, and touch-tone keypad selection and response can come as a callback, fax, email or other contact methods. Commonly referred to as skills-based routing. Cloud routing means having the control to route call traffic. It ensures callers are directed to the right and appropriate agent quickly. 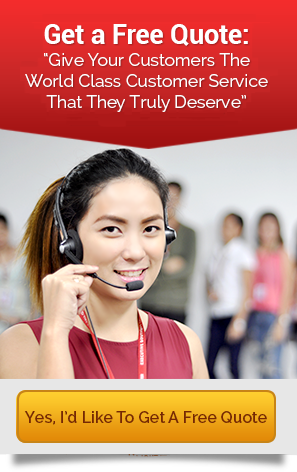 The Philippines is fondly known as the Call Center Capital of the World. Our language skills, affinity to the Western culture, and competitive costs are among the factors keeping us as the number one choice. 1. They are a personal fit to your business needs. Start by defining what your business needs are. What is your core function? What communication channels do you use when interacting with your customers? Do you email, chat, call? How many agents do you need to support your operations? Will you need it 24 hours? Understand your business needs first before deciding which contact center is the best fit for your organization. 2. They use state-of-the-art hardware and advanced software solutions. With new technology always on the rise and continually evolving, it is crucial to ensure the company you choose is keeping up with the latest, especially when it comes to security. With cyber crime, an ever-present threat, choose a contact center that has the latest security measures to keep your data safe and secure. 3. They are a well-established company with a solid reputation. The contact center you choose is your company extension. How they operate and deal with your customers reflect on you and your company. Before making your decision, consider their track record and what other companies that have served them, have to say about them. Training programs guarantee development and improvement. Well-trained employees are efficient and productive employees – they cement the company’s success. Contact centers that have strong training programs in place also mean that they can adapt to your business. When considering outsourcing IT support, look no further than, Executive Boutique. We are HIPAA and PCI Compliant and the trusted outsourcing partner to clients in the US, UK, Canada, Singapore, Europe, and Australia. Whether you are a small or medium-sized company looking for the best support for your operations at competitive pricing, we are here for you! AHT (Average Handling Time) is one of the most important metrics in a call center. Simply put, a low AHT is one of the good signs that a call center is delivering great customer service. That’s not in the least surprising. When customers call, they want solutions, and they want them fast. Since it’s the goal of every call center organization to deliver a positive experience to customers, it only follows that you take the necessary steps to reduce the amount of time they spend on calls. Here are proven strategies you can use to reduce average handling time in your contact center. A strong knowledge base allows call center agents to pull up customer information and resolve issues with minimal effort. When the knowledge base is optimized, agents can find relevant answers to even the toughest queries at their fingertips. This way, agents are able to close calls quickly, which in turn makes customers happy. A call center needs to have a system in place that records and analyzes calls. This makes it possible for you to identify which issues and questions are usually taking a long time to be resolved. Once these issues are identified, you can come up with more efficient solutions to resolving them. By training your agents to execute such solutions, average handling time can be reduced significantly. One great way to reduce AHT is to optimize call routing. After all, a lot of time is wasted every time a caller is routed to the wrong department. The best way to speed up your call center’s call routing system is to use a high-end automatic call distribution software (ACD). When customers are always able to reach the agent qualified to handle their issues, it takes significantly less time to end a call. Sometimes a customer will call in with an issue that is much too complex to be resolved immediately. Agents need to be able to identify such cases quickly since attempting to resolve the issue right then and there will only be a waste of time. What agents can do instead is to initiate a call back at a time when answers and solutions to the customer’s issue are readily available. Recent studies show that more and more customers prefer self-service over having to speak with a customer service representative. However, it can be frustrating to a caller when the IVR system eats up a lot of time promoting your brand’s wide range of products and services. To optimize your IVR configuration effectively, you can start by structuring your IVR according to the customer’s perspective. Make your IVR scripts short and simple. In addition, you can provide pre-recorded messages in a way where customers can help themselves better. A call center organization has to manage AHT the right way and for the right reasons, and you can pull that off by employing the five strategies mentioned above. The question of whether it’s preferable for organizations to prioritize internal hires over outsiders when filling a job vacancy has long been settled for years now. And the general consensus is this: internal hires trump external hires almost every time. Internal hires perform much better on the job in the first few years following a promotion than outsiders who were recruited for the similar job. External hires have higher exit rates than internal hires. External candidates are offered higher salaries (up to 20 percent%) than internal hires. All results point to the same conclusion: promoting those belonging to the existing employee base is far more recommendable than hiring from outside. While there’s no study similar to Bidwell’s that exclusively applies to call center organizations, logic dictates that the same rule still applies. Here are five reasons why call centers will do well to prioritize internal recruits over external candidates in their recruitment efforts. Call center organizations spend quite a hefty amount each year in recruiting new hires. On top of paying for advertisements, the HR team also has to allocate expenses on pre-screenings and interviews before deciding to hire a new employee. And don’t even get started on the training expenses. Do you know that the average call center spends nearly 2,000 dollars training each new recruit in a span of 4 weeks? In fact, this Tenacity article has been kind enough to do the math for us. Considering the high employee turnover rate in most call center organizations, there’s no question that prioritizing internal hires over outsiders is the more attractive route. Besides, all the money expended on advertisements, screenings, training classes, etc. would be better spent on empowering your current employee base and boosting their morale. As if the hiring process isn’t strenuous enough, the company also has to invest some time in orienting new employees to the company’s vision, values, technologies, and processes as soon as they are hired. In addition, new recruits also have to go through a steep learning curve before they can get acclimated to their new environment. In contrast, promoting an existing employee allows you to do away with all that. Considering the call center industry’s fast-paced environment, time is a luxury you don’t have. Rewarding productive employees with a promotion is an excellent way to foster a culture of loyalty, growth, and stability in the organization. When employees feel that their hard work and dedication are rewarded by the company, they are more likely to feel more motivated to give it their best at work. Moreover, unlike external recruits, existing employees are already familiar with the organization’s policies and procedures, and as such will be much more productive right from the get-go following a promotion. By promoting deserving employees, you are giving them a sense of growth and direction in their career within the organization. This, in turn, motivates them to take ownership of their roles within the company and as a result, will give it their best efforts. While external hiring has its own merits (for example, new hires are more likely to bring new ideas to the company), studies and current sentiments show that internal hiring is far more preferable as a recruitment strategy. When existing employees feel that they can count on the company to provide them career opportunities that they worked hard for, it gives everyone a better sense of stability.